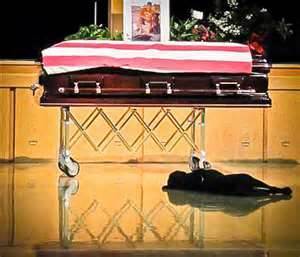 The dog is Hawkeye; his owner, a Navy SEAL, was killed in Afghanistan in August 2011, when a rocket-propelled grenade hit his Chinook helicopter. The photo – and the story – went viral as an iconic depiction of the profound bond between people and their pets. 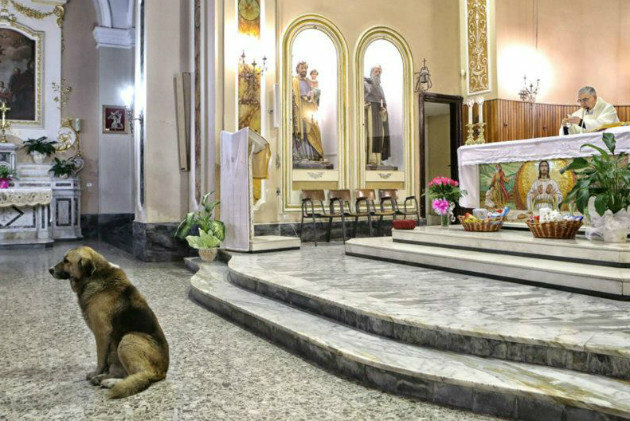 Now comes Tommy, a seven-year-old German shepherd in San Donaci, Italy, who has been attending mass for the last two months at the church where his owner’s funeral was held and where, before she died, they attended mass together daily. But so far as I know, only one dog has been memorialized in bronze for his exceptional loyalty. In 1924, Hidesaburo Ueno, a professor at Tokyo Imperial University adopted an Akita he named Hachiko. 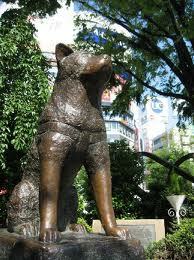 Each morning, dog and owner would walk to Shibuya Station, where Ueno would catch a train to the university. Each evening, Hachiko would return to the station to welcome the professor home. But on May 21, 1925, Ueno didn’t return; he’d died after suffering a stroke during a faculty meeting. From that night on, for nearly ten years, Hachiko returned to the station at precisely the time Ueno’s train was due to arrive. A newspaper story about the loyal Akita lured people from all over Japan to visit him. In 1934, a bronze statue of Hachiko was erected in front of the station’s ticket gate with the dog on hand for its unveiling. During World War II, the Japanese melted the statue to use its bronze for the war effort, but in 1948, the original sculptor’s son created a replica, which still stands today. The statue is said to be one of the most popular meeting places in all of Tokyo. Hollywood knows a good story when it hears one, and Hachiko’s was too good to pass up. Thus: Hachi: A Dog’s Tale, A True Story of Faith, Devotion and Undying Love hit U.S. theaters in 2009. The story is true only in the Hollywood sense; produced for an American audience, it is set in a quaint New England town, and the professor is played by a very handsome Richard Gere. Joan Allen is Gere’s wife, and Jason Alexander is Carl, the train station attendant. My family rented the movie a couple of years ago and cuddled on the couch to watch it, without any notion of its Japanese roots. Reading about Tommy started me thinking about Hachi, the movie, and then Hachiko, the dog. And then I thought about my dogs. For me, Galen is more than a companion or a best friend – she is a deeply loved member of my family, as was Gryffin before her. I’m not alone in my thinking. A 2011 Harris poll found 92% of dog owners considered their pooch part of their family. Back to Hachi: The movie is definitely worth watching. Just be sure to grab a tissue… or two, or three. Actually, grab a whole box. If you’re anything like me, you’ll need it! I can still see my first dog. For six years he met me at the same place after school and convoyed me home—a service he thought up himself. A boy doesn’t forget that sort of association. This entry was posted in dogs, Galen, Gryffin, Hachi, Hachiko, musings, Quotes, Uncategorized. Bookmark the permalink. You should get a copy of My Dog Lala by Roman Kent. It tells how when he and his family were sent to a ghetto in Poland, Lola travelled miles every night to find them, but left each morning to return to her puppies. Thanks for letting me know about the book. Barnes and Noble, here I come!